One step closer to the weekend everyone! Yet another dreary day here in Boston so I’m brightening up my wardrobe! Today’s pieces are from Loft and Kendra Scott. Loft is my go to brand for work. The pieces are classic and affordable for any price point! Today I have on a red v-neck sweater, versatile for work and play. I also am a big fan of circle and floppy skirts, and have a new one in herringbone on as well. Find it here at Loft. Accessories are key and one of my favorite accessory designers is Kendra Scott. I can’t tell you how many complements I get when I wear her pieces. 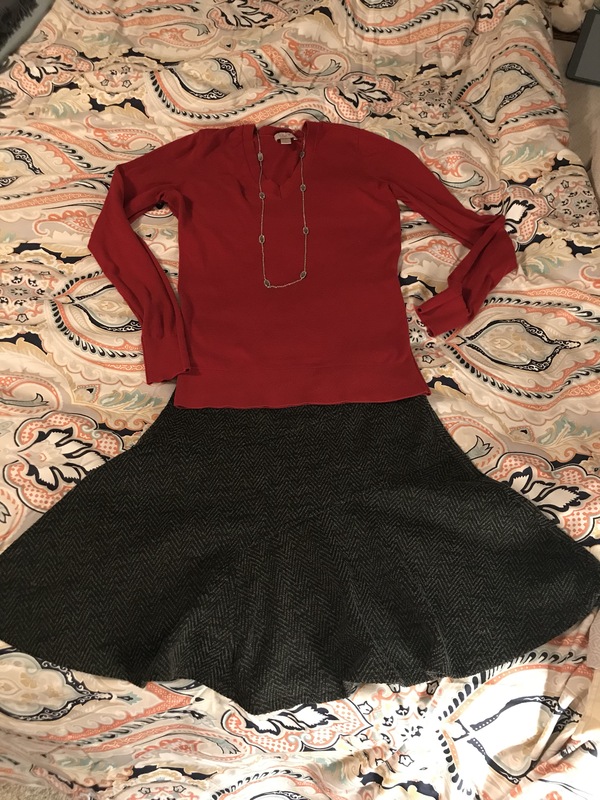 Today I’ve styled my v-neck with a long necklace with gray and silver tones to match my skirt. She doesn’t carry this particular one anymore but here is a similar one and it’s ON SALE! Tonight I’m going to the #nhlbruins game with my bestie. I’ll share my outfit for faceoff later!